If you are organising a Christmas Party this year and you are looking for unique entertainment that your guests will remember for years to come, you have come to the right place! Harlequin Fun Casino Hire will bring all the fun of Las Vegas to your Christmas party this year with a fun casino night. 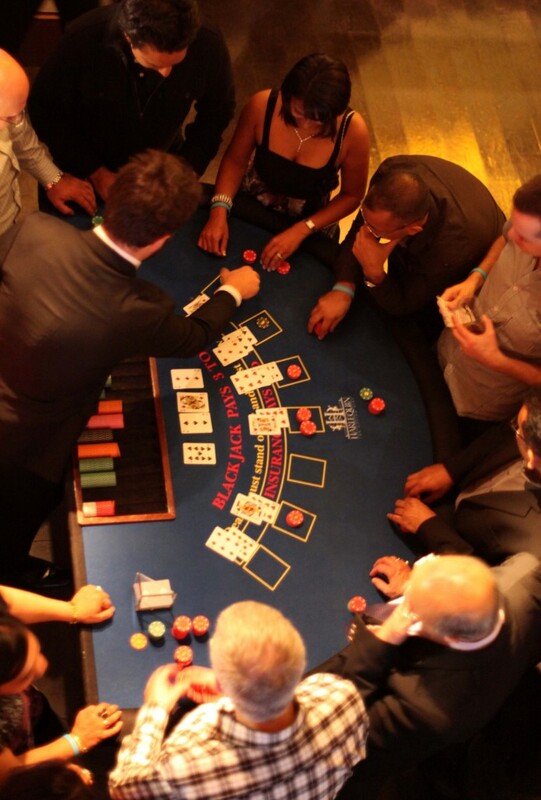 We can accommodate anything from small groups to large gatherings at your event, with our full size roulette and blackjack tables and highly skilled, professional croupiers. At a fun casino table, there is never a dull moment. The thrill of the competition is tangible, and it’s completely risk free as it’s only for fun. It’s also a brilliant way to break the ice between guests who perhaps do not ordinarily socialise together. People playing at a Roulette table shoulder to shoulder tend to get wrapped up in the atmosphere and let their hair down around each other. It’s perfect to ensure everyone interacts and has fun together. A Christmas Fun Casino gets people chatting and pulses racing, and ensures even the most reserved among your guests lets their hair down. It’s impossible not to have fun when you’re playing casino games! A Christmas Fun Casino is the ideal ice-breaker at an event where guests are meeting for the first time. It’s a way to ensure people start talking and interacting with each other in a relaxed and informal atmosphere. A Christmas Fun Casino is a unique way to entertain your guests, and is sure to be remembered and talked about for years to come. A Christmas Fun Casino creates a fun, exciting atmosphere at your event which can’t be matched in any other way! It’s fast paced, sophisticated and incredibly social. A Christmas Fun Casino is a cost effective way to make a real impact on the guests at your Christmas Party this year. Our casino tables look very grand and impressive and are sure to impress. We’ll bring our casino tables to your venue, set them up, and our experienced croupiers will make sure your guests have a fantastic night throughout the entire gaming period. We’ll deal directly with your venue to ensure a fluid set up and ensure we have enough space to set up the tables. There’s such an electric atmosphere at a casino table that just can’t be conjured up anywhere else or by anything else. Don’t just take our word for it, ask around at work and see what the others say. There’s a good chance your colleagues will have been to a fun casino party before and will be able to tell you first hand how much fun they had! We’re biased, but we’re right! At a fun casino, no real money changes hands, it’s all just for fun, so your guests can relax easy in the knowledge they won’t risk losing a penny. We distribute fun money at the start of the event which your guests can exchange for casino chips at each of the tables throughout the course of the night. We can provide prizes for the best players (or biggest losers) on request, and you’re welcome to offer prizes of your own too. If you’d like more information on how to hire a fun casino, take a look at our helpful guide to ensure you make the right choices for you and your guests. A fun casino is a great way to bring people together in friendly competition and excitement for all. Call us now to pencil your Christmas party date in our diary. It’s never too early to book your Christmas party casino, and we’re never too busy to offer you friendly advice and information with no obligation to book.